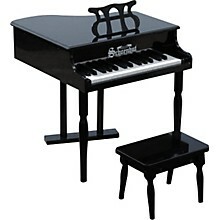 A 30-key miniature version of a baby grand piano for children. 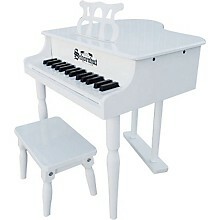 Schoenhut's 30 Key Classic Baby Grand is designed to encourage a child to play and develop a love of music. Elegant in appearance with graceful spindle legs, yet extremely durable and sturdy, it makes a beautiful addition to any home. Lovely chime-like tones are produced by small hammers striking metal rods, the sound that makes Schoenhut toy pianos unique. The two-and one-half-octave span of full-width keys provides a good foundation for the transition to a larger model. 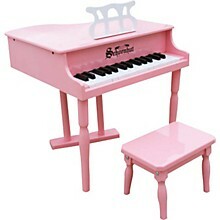 Open up a stimulating world of music for your children. Order today!